Forward Ivan Barbashev never felt out of place or intimidated as the youngest member of the Russian National Junior Team at the 2014 IIHF World Junior Championship in Sweden. "I looked at it as my dream come true to play for my country, and wanted to use the experience to learn more and help my team win a medal," Barbashev told NHL.com. Barbashev would help Russia win the bronze medal playing a third-line role, producing one goal, two points, a plus-1 rating and 12 shots on a line with Edmonton Oilers 2013 third-round draft pick Bogdan Yakimov. He didn't play much on the power play but did get plenty of opportunities on the penalty kill. It was a role with which Barbashev wasn't accustomed, but he did his part nonetheless. 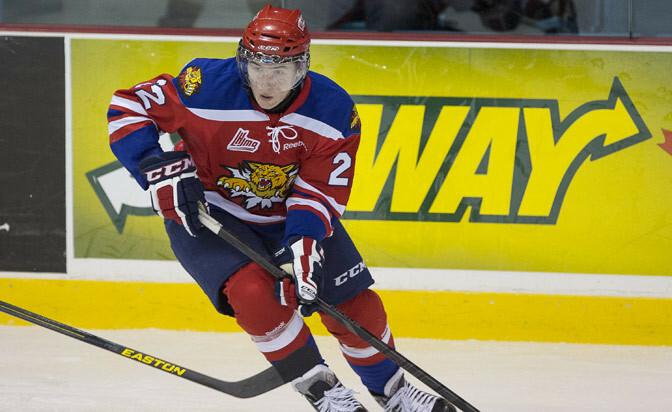 He's now proving to be just as valuable as a member of the Moncton Wildcats in the Quebec Major Junior Hockey League. In two seasons, the 6-foot-1, 185-pound left-handed shot has 43 goals and 130 points in 116 games. "Coach told me I need to play much better in the defensive zone because I was on the third line," Barbashev said. He's adjusted quickly. As a rookie in 2012-13, Barbashev played wing at the outset, but was ultimately shifted to center and adapted well. Scouts appreciate his compete level, hockey sense and defensive-zone coverage, an uncommon trait in some young Russian players daring to give the North American game a shot. "It was really important to me, because I want to play in the NHL," Barbashev said. "I was thinking about moving to Canada three years ago. I talked to my father (Dmitri) and agent (J.P. Barry) because, in Canada, that's my style of hockey. The physical game and stuff like that; that's why we moved to Canada." There's little doubt Barbashev will be one of the first players from the QMJHL selected at the 2014 NHL Draft in June. He and Nikolaj Ehlers of the Halifax Mooseheads are considered to be the top two players from the league eligible for the draft this year. "Last year was really hard for me [during the adjustment]," Barbashev said. "I really didn't know the language for the first three months. But this season I'm feeling much more comfortable. I learned a lot from last year on and off the ice. I know I need to keep working hard every day in practice." Born in Moscow, Barbashev this season has 25 goals and 68 points in 48 games as an alternate captain for Moncton, including 22 multiple-point efforts. He also has a 46-percent efficiency on faceoffs, winning 443 draws, but is bothered by his minus-11 rating. He produced three goals and 12 points in eight games in the month of January and eight goals and 18 points in 10 February games. As a rookie in 2012-13, Barbashev connected for 18 goals and 62 points with a plus-9 rating in 68 games. He is No. 12 on NHL Central Scouting's midterm list of the top draft-eligible skaters in North America. Ehlers, who has 43 goals and 91 points in 57 games for Halifax, is No. 22 on Central Scouting's midterm report. "Ivan is a strong skater; he reaches top speed quickly and is a very good playmaker with quick hands," Central Scouting Director Dan Marr said. "He's not afraid to mix it up, competes one-on-one and battles for pucks. He can be a game breaker." Barbashev was the No. 1 pick by the Wildcats in the 2012 CHL import draft. He was inserted on the top line alongside Sam Reinhart of the Kootenay Ice and Michael Dal Colle of the Oshawa Generals for Team Cherry at the CHL/NHL Top Prospects Game in Calgary in January and had one assist. "He's a tough kid; will play and give it his best," Central Scouting's Chris Bordeleau said. "He's a good skater." It's interesting to note that Barbashev sat out five games with a lower-body injury in October, but struck for seven goals and 13 points in his first seven games back. "I do think I can still improve in the defensive zone," Barbashev said. "I always have a minus in every game, and I don't know why. Coach [Darren Rumble] told me I need to work more in the defensive zone. I'm trying to do that and it's something I learned a lot at the World Juniors." In addition to his participation in the 2014 WJC, Barbashev played for Russia at the 2013 Under-18 WJC, and had three goals and nine points in seven games.